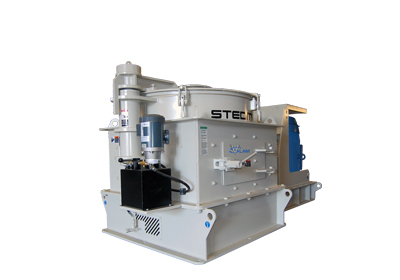 Our vertical shaft impactors feature multiple rotor configurations for various applications. From open and enclosed rotors to the Stedman Patented Tubular Rotor, each machine is configured to provide customers exactly what is needed for their unique application. The V-Slam has a wide speed range as well as the highest rotor tip speed allowing a high degree of process control. Raw feed sizes up to 5"
Read the Stedman V-Slam™ VSI Guide! The Stedman Testing & Toll Processing Facility is the place to test your material in our full size VSI. If it can be crushed, ground, pulverized or mixed, chances are we’ve done it. We have more than 10,000 test reports to help get you to the best solution quickly. To learn more about what to expect from testing, read this article that ran in POWDER BULK ENGINEERING magazine.